Water cascades over rugged sandstone outcroppings on the north side of Route 60 from Falls View to Gauley Bridge (MM-92 to MM-97). Experience the dramatic Kanawha Falls on the south side of Route 60 (MM-93). At the waterfall pulloffs, notice above the falls the remains of the original Midland Trail as conceived by George Washington and completed to Cedar Grove in 1790. Anglers may test your skill where the Kanawha headwaters cascade over the dramatic Kanawha Falls. Enjoy a beautiful view of the cascading water while picnicking at Kanawha Falls Park (MM-93). 6. Pull off, beautiful rock, long narrow, stream with log over it. 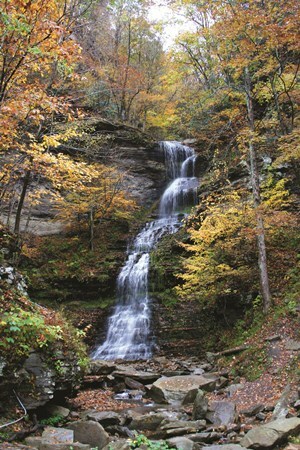 Cathedral Falls is one of the most-photographed spots in West Virginia. Overlooking Kanawha Falls, the stately Glen Ferris Inn is listed on the National Register of Historic Places.